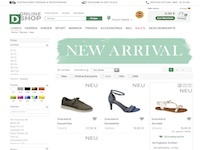 At Deichmann you will find fashionable shoes for women, men and children. Return in the store, free service hotline, the latest trends, free shipping. Each order of a customer (new customer and existing customer) is reimbursed at a flat rate of 4,00 EUR. Payment received. Returns are not remunerated. Free shipping for new customers. Incentive traffic is permitted.